Hurrah! The 15th annual Hong Kong Cleanup has officially wrapped, and the preliminary results are already suggesting that this may be the biggest year yet for the longstanding initiative organised by Ecozine and The Nature Conservancy. The Hong Kong Cleanup Challenge is the region’s largest volunteer environmental event; it engages citizens from all walks of life in cleanup activities, which are aimed at not only removing harmful trash from nature, but also raising awareness through hands-on experiences. Hugely popular among corporates and schools, the event also sees clubs, communities, families, NGOs and even government departments joining the annual effort. 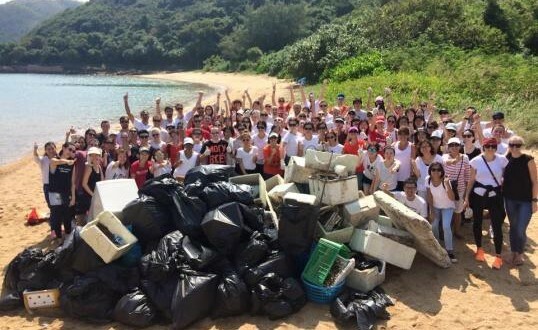 Over the ten-week Challenge (Sept 19th – Dec 1st), hundreds of teams carried out cleanups across Hong Kong Island, Kowloon, the outlying Islands and Sai Kung. Group size ranged from single individuals all the way to large groups of almost 200 people. Some teams spent the afternoon collecting micro plastic to fill one large trashbag, while others focused on beaches littered with large pieces of Styrofoam and plastic bottles collecting upwards of 190 bags. In addition to being a well-loved household name locally, the Hong Kong Cleanup represents part of a massive global movement. 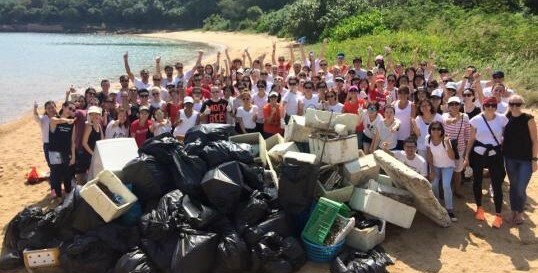 As Hong Kong’s official coordinator for Ocean Conservancy’s International Coastal Cleanup (ICC), the Hong Kong event contributes to global cleanup, awareness and solution-seeking efforts. The Hong Kong Cleanup has had an unmistakable impact on the environment and community. What started 15 years ago as a simple idea with a few friends has grown into a civic movement empowered by over 250,000 people. It has spawned numerous other NGO and government actions in that time. To this end, the Hong Kong Cleanup has set a huge goal for its 15th anniversary: to engage five per cent of Hong Kong’s total population with its activities. Starting with those who have participated firsthand during the Cleanup Challenge season and the many members of their online social media community, the organisers will launch exciting new activities in 2016 to increase citizen engagement over a 12-month period. Hong Kong generates 6 million tonnes of waste per year – equivalent to 240,000 double decker buses, more than 50 times the number of buses in Hong Kong – and the government is already spending millions of dollars to clean up and dispose of it. The Hong Kong Cleanup not only provides a way for tens of thousands of participants to remove rubbish from our environment, but it also reinforces that each of us, as consumers of goods and producers of those goods, has a responsibility to reduce, prevent, and clean up.